With Job Matching, we can compare a person's DISC profile with the ideal for any job or role, and sum up how well their personality matches that role's needs. DISC explains a personality in terms of four numbers, and quantifying a person's behaviour like this brings some significant advantages. This opens up, for example, the possibility of Job Matching. 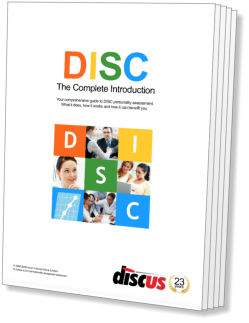 If we use DISC to predetermine the ideal personality style for a role, Discus can match the factor values in a DISC profile against that ideal, and so work out how well a candidate is suited to that role's needs. Because we know all the personality factors involved, it's even possible to highlight strengths that stand out, or areas where a person may need development. It's important to stress that DISC Job Matching can only look at an individual's personality, and it's therefore limited to describing suitability in those terms, but nonetheless it can provide a powerful basic guideline in helping to make a recruitment decision. An introduction to the most important features of the Job Match, including a summary percentage figure. Areas where the candidate shows particular strengths or aptitudes needed for the role. Areas where the candidate will likely need training or development, with useful behavioural questions. As well as finding how well a personality matches a job, we can also reverse the process to create a Candidate Match. If we have a job, and a set of DISC results for each applicant, Discus can search through those applicants to find the ones whose personalities are closest to the ideal. For reference, a textual summary of the key personality needs of the matched role. A selection of alternative matches in related roles, each indvidually rated for the candidate. Both types of matching, Job Matching and Candidate Matching, rely on having a predefined personality profile for the job we're matching against - a Job Profile. A natural question would be: where does this ideal DISC profile come from? There are two possible answers to that question. The simplest and easiest is to select a template from a library of predefined profiles. Discus includes several hundred templates for the most common types of roles, from categories as diverse as administration or sales, or specialised as education or media. All the facts and figures you need to understand the DISC basis of a Job Profile. A textual explanation of the Job Profile's needs, summarising the ideal candidate for the role. Those templates are a useful starting point, but the best possible approach is to create your own custom Job Profile to match the exact needs of a job. Discus includes a complete built-in Job Profiler service to help you do just that. You can start, for example, by answering a set of questions about a job that's analogous to a normal DISC questionnaire, and from those answers Discus will build a Job Profile. For more advanced cases, the Job Profiler provides a host of other options, so you can (for example) base a Job Profile on the personality of a really successful candidate, or 'tweak' the profile's settings to match your needs perfectly. Discus provides a huge library of profiles for potential roles for you to match candidates against, or you can create your own custom Job Profiles using Discus' range of built-in profiling tools. Job Matching: Discus can match the factors in a candidate's personality against an optimum Job Profile to describe how well they fit the needs of that role. Candidate Matching: Based on the needs of a role, Discus can also match a group of candidates or applicants to find those best suited for that role's personality needs. Job Profile Library: Discus includes a library of some three hundred different job templates covering a whole range of different commercial roles. Job Profiling: Building a profile for a job is easy with Discus' built-in Job Profiler suite. Create a Job Profile from a simple questionnaire, or use more advanced tools to specify your needs exactly. Free and Unlimited: Job Matching and Job Profiling are a free and unlimited part of the Discus service. Registered Discus users can apply Matches and create Job Profiles without any restriction. See Sample Reports: See how a Discus Job Match works in practice with our sample Discus Job Match Report. You can also look at a Job Profile in more detail in our sample Discus Job Profile Report.